The U.S. airstrikes in response to the chemical weapons attack in Idlib province last month triggered calls for greater outside military force against the Assad regime by some of the Syrian opposition. Yet, in a country exhausted by armed struggle and the presence of extremist groups, local civil initiatives have proven to be more effective at building peace than increased military involvement. In Idlib City, ordinary citizens have shown that they are capable of managing their civil affairs, alleviating suffering at the local level and rolling back extremism by themselves. 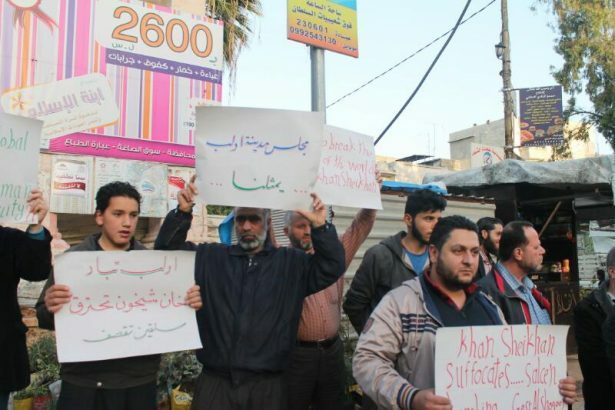 On March 3, 2015, an umbrella group of Islamic armed factions called Jeish al-Fateh expelled the Syrian government from Idlib City, sparking an ongoing struggle by citizens and civil resistance groups to gain control of the city’s administration. After it took control of the city, Jeish al-Fateh — which includes Jabhat Fateh al-Sham, formally known as al-Nusra Front, a group affiliated with al-Qaeda — formed a Shura Council to manage the city’s military and civil affairs. The armed group appointed its members and loyalists to administer the city without paying attention to qualifications or proper recruitment procedures. A state of repression was imposed, and there were continuous violations of basic human rights and freedoms under the pretext of applying proper Islamic Sharia law. This brought activists and civil organizations into direct confrontation with the armed group, which assumed the administration of all public services, including education, health, security and justice. In response, residents and civil resistance groups have been working to establish a local council of qualified civilians to prevent military factions from interfering in civil affairs and protect peoples’ rights and freedom. 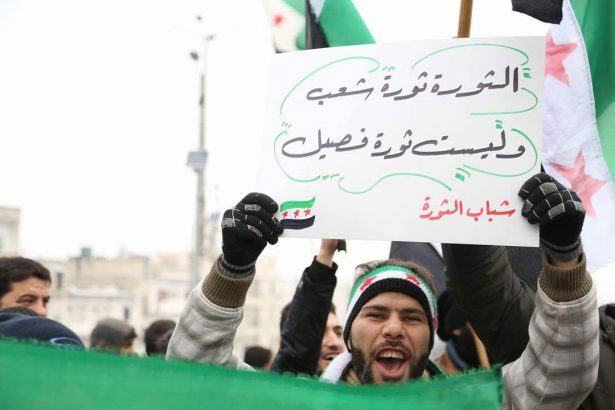 “We wanted to prove our commitment to our initial goal of revolting against all type of corruption and injustice,” said Sakhr Baath, a lawyer and member of Idlib Youth Group, which was established by activists at the early stages of the Syrian uprising in 2011 to galvanize citizens against the regime and now the inhuman practices of Jeish al-Fateh’s leadership. The group also initiated relief and humanitarian projects, including the rehabilitation of schools and the formation of volunteer teams to direct traffic and crowds. “These activities helped them [the civil organizations] gain a great reputation and the community’s support,” Baath added. Idlib City was one of the first cities after the uprising began to show open and organized civil resistance, even in the presence of the government. The city’s professionals established the National Opposition for Idlib Intellectuals in August 2011 to find solutions to sectarian divisions that plague Syrian society. According to Baath, the group used to host meetings and invite government figures and supporters to discuss their views with the community. At that time, activists — with the support of Syrian expatriates — began to self-manage areas outside of the government’s control, provide humanitarian assistance, guard the city at night and control traffic. Established six months after Jeish al-Fateh took control of the city, Al-Idlibi House became the largest civil organization in Idlib, with more than 400 activists and members. They met every Thursday to discuss the city’s affairs and decide on the best tactics to pressure armed factions to hand over civil administration to the community. They organized media campaigns, public demonstrations and sit-ins to demand civil rights and express their opposition to the control of the city by extremist groups. “We established Al-Idlibi House to unite the voices of the people and have a body to negotiate with the Shura Council on behalf of the community,” said Abd al-Latif Rahabi, the head of Al-Idlibi House management. Women were also active in this struggle and established many groups and humanitarian organizations, including Women’s Fingerprints, Glimmer of Hope, and the Association of Educated Women. These organizations raised awareness of women’s role in building society, and provided educational and vocational courses. They also established orphanages and care centers for people with special needs, and initiated projects involving sewing and producing homemade food for women who could not leave their homes. Female preachers were also reaching out to poor and vulnerable women to convince them to comply with Sharia law. “We formed volunteer groups of female psychologists and sociologists to visit vulnerable women and raise their awareness of basic rights and freedoms to counter the extremists’ views,” Zidani said. According to Rahabi, Al-Idlibi House’s committee nominated a group of lawyers and judges to establish rules and regulations to manage the electoral process, protect the right of voters to freely choose their representatives, and ensure candidates’ rights to monitor the election. 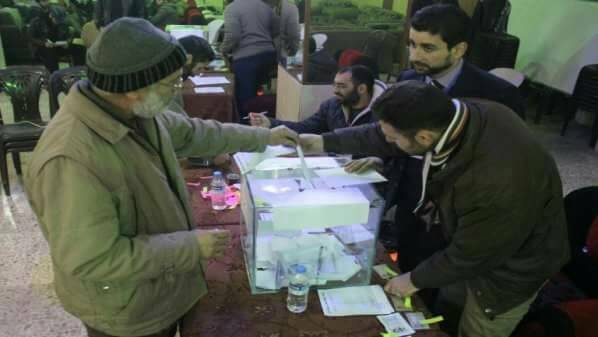 Al-Idlibi House, with the support of the community’s members, established and equipped an electoral center with ballot boxes and private rooms for those wishing to vote secretly. On January 17, about 900 people voted, including 43 women. Eighty-four people were nominated for 25 spots on the council. All stages of the electoral process on election day were filmed and documented — by the media, community activists, and groups of lawyers and judges — to ensure that the process was legitimate, Zidani said. Those organizing civil activities faced many challenges, including regime airstrikes on the city, continuous fighting between armed factions and regime forces, and pressure from Islamists who tried to disrupt and discredit their efforts. “Despite all of the hardships, we continued with our regular meetings, demonstrations, sit-ins and media campaigns until we got what we wanted,” Zidani said. Three month after its establishment, the local council is managing most services, including water, electricity, bakeries, civil defense, firefighting, and the directorates of transportation, communications, agriculture and environment. With their vibrant activities, women’s organizations are participating in the council’s activities, voicing their concerns and suggesting solutions. 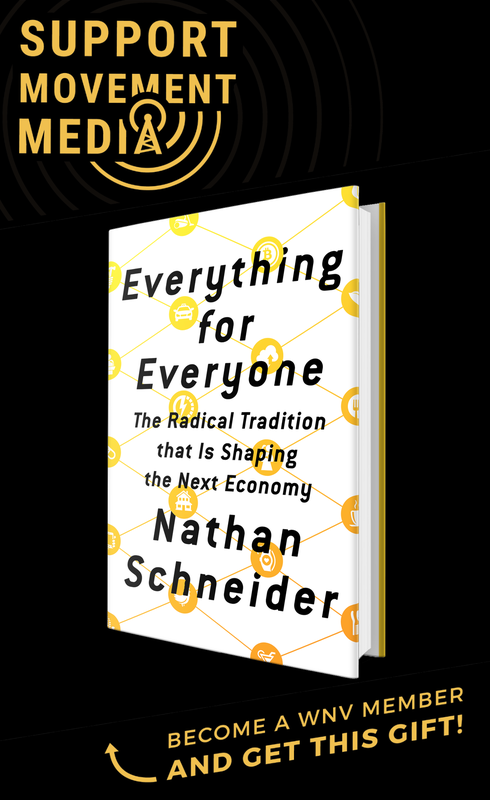 While many international organizations and donors refuse to work in places under the control of Islamic armed factions — fearing that funds could end up in the hands of extremists — one of the most important tactics to fight extremism is to support civil organizations and initiatives. As evidenced by these civilian efforts, such initiatives are effective, and they are bringing peaceful and constructive changes into their communities. You mention local councils. Is this part of the movement spurred on by Omar Aziz? Thanks for the article. It opened up my mind to the only viable solution for the Syrian people to take back their country from foreign invaders, dictatorship, and the armed extremist junkies.